I stare at the notes I’ve written for this interview and shiver, not from cold but the foreboding in my spirit. Worries of how this session will play out resurface. Why can’t I just relax? What could God possibly want me to share about Delilah’s story? The woman labeled as the naughty girl of the Bible couldn’t possibly have anything to teach us. Could she? I rub my arms in an attempt to soothe the angst welling in my soul. Why did you lay her on my heart, Lord? The door opens, interrupting my thoughts. All heads turn to catch a glimpse of the raven-haired beauty. Dressed in a coral gown revealing ample cleavage to entice every man to stare, she sashays through the café, winking as she passes each table. Their mouths drop, stopping all conversations. I can almost see the drool forming. I push the bile in my throat down, regret filling my heart for scheduling this interview. I say a prayer asking for guidance and stand to greet the temptress. I mentally kick myself for my judgmental attitude. Wasn’t I just preaching a few weeks ago about how we need to look on the inside? “Do you mind if I tape our conversation?” I say, changing the subject. “You like to get right down to it, don’t you? Of course not.” She pulls a compact from her clutch purse and checks her makeup. Wow…this is going to be tough. Give me strength, Lord. The waitress appears to take our order. I’m thankful for the interruption, clearing my thoughts of disgust. I shuffle my papers and decide to move on to another topic. “He fell in love.” Her smile brightens. “He was just another client.” She shifts in her chair. Her words don’t match her actions. Why would she lie? Did she feel more? I glance at my next question. How will she respond? I tap my pen, wondering how best to word it without casting judgment. My jaw drops. She didn’t even think about her response. I take a sip of my coffee, gripping my mug tight to curb the anger threatening to surface. How could she be so callous? 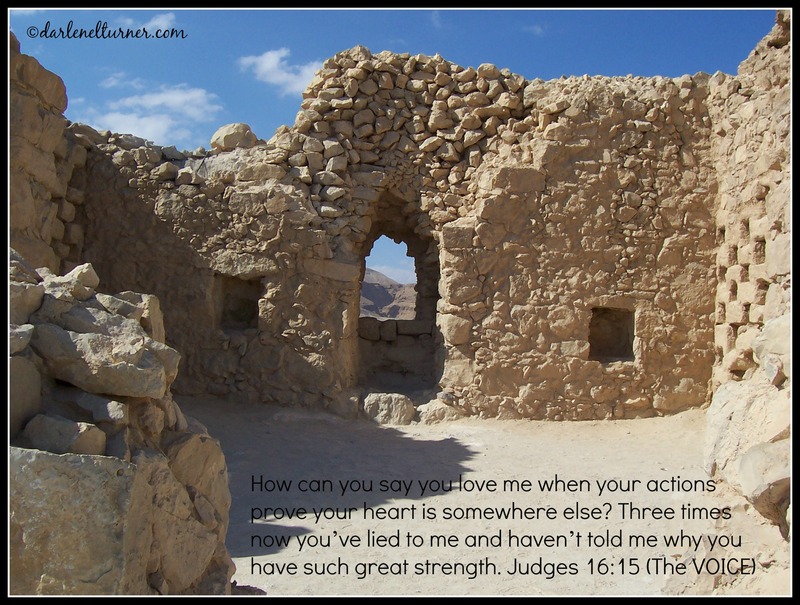 “The Philistine officials were offering an exorbitant amount of riches, love. Wouldn’t you?” She drinks her tea, letting the question linger in the air. “I thought he was different from the others.” Her gaze follows a young couple leaving the café holding hands. Is that longing in her eyes? Perhaps there’s more to her story than she’s sharing. A question pops into my mind. One that isn’t on my list. Tears well in her eyes. She wraps a cloak around her shoulders, covering herself as if she’s trying to undo everything she did. I search her face for deceit. Could she be manipulating me like she did him? No, the assertive, flirty woman who entered the café no longer sat across from me. Even though she used her beauty to betray him, You used her for Your bigger plan. We need to trust in that. Perhaps she did love him. We may never know, but God loves us even when we sin. Even when we go ahead of Him and try to manipulate our own path, He will set us straight and steer us back because He loves us. We just need to ask for His forgiveness and step back onto the trail He’s routed for us. I squeeze her hand, smiling at the naughty girl of the Bible. Yes, we can learn from her story. What do you think? Is there anything else Delilah’s story can teach us? Share your thoughts. Your word is a lamp for my steps; it lights the path before me. Thanks for your encouraging words! We’ll definitely have to chat about this! “Even when we go ahead of Him and try to manipulate our own path, He will set us straight and steer us back because He loves us.” Beautiful healing words for one who has found herself wandering away from her path. As I read these words, tears of sorrow, then healing, flowed. Thank you Dar for your faithfulness to write as God leads, even when its difficult. My heart jumped when compassion filled your heart and you put your hand on top of hers and shared the phase “God loves you and used you for a bigger plan”…This story reminds me never to give up on someone you think can’t be reached…Its usually when we feel defeat…God opens the door with that person. Love the picture of the road on Harrison Mountain too!!! Thanks for your kind words, Rolly. I appreciate you stopping by!